Tom DePlonty, one half of the duo Paragaté, told me via e-mail that he and musical co-conspirator Tim Risher had always thought about doing an album of “drum-driven stuff” and this is “us just going ahead and doing it.” But when these experimental gentlemen get their hands on that concept, what you end up with is something that feels like a subversion of the club-music paradigm. There are catchy beats and the study thump of the bass drum, but in the style of this always adventurous duo, there is also a lot of extraneous-yet-essential sound happening all around it. Many of the tracks here are cousins to straight-up glitch, things stitched together out of rapid-fire mini-sounds. “Crash License,” for example, which has something in its core sound that makes it feel like a devious remix of the oddball 80s tune “Warm Leatherette” by The Normal. Catchy and frenetic, it hurries by at a dizzying pace. “Batteries Not Included” wanders into plunderphonic territory, wrangling and mangling vocal samples over chittering, poppy sounds and a beat that immediately hones in on your toes and gets themn tapping. “Generation of the Thoroughly Smug” chugs and bounces along and even tosses in a little drop for good measure. 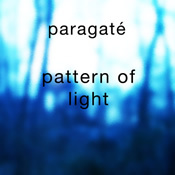 Paragaté offer up 11 tracks over Pattern of Light‘s 45 minutes, and while the conceit can run a trifle thin during a straight listen, it’s a great release to have shuffled in. I don’t feel like it ranges as far as most of DePlonty and Risher’s releases, but it’s been a go-to feel-good listen for me since I got it. Well worth checking out.